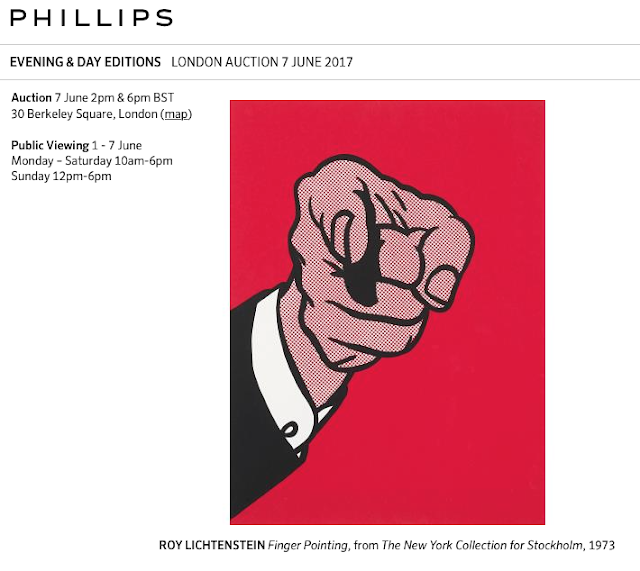 Roy Lichtenstein's Finger Pointing screenprint was originally created as one of 30 limited edition prints included in the 1973 New York Collection for Stockholm Portfolio published for Moderna Museet. 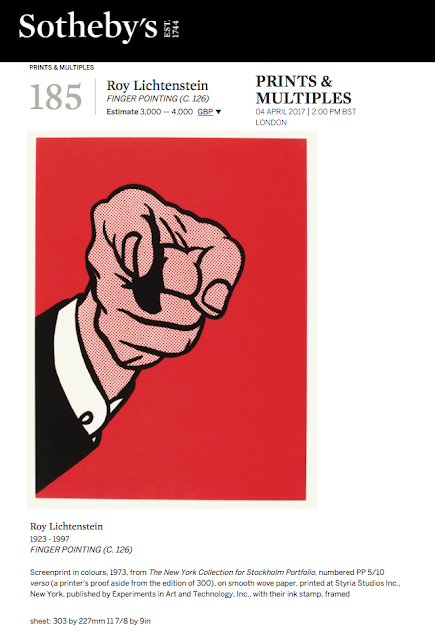 For perspective, regular numbered impressions of Finger Pointing from the edition of 300 have auctioned separately about 5 times over the last 3 decades. 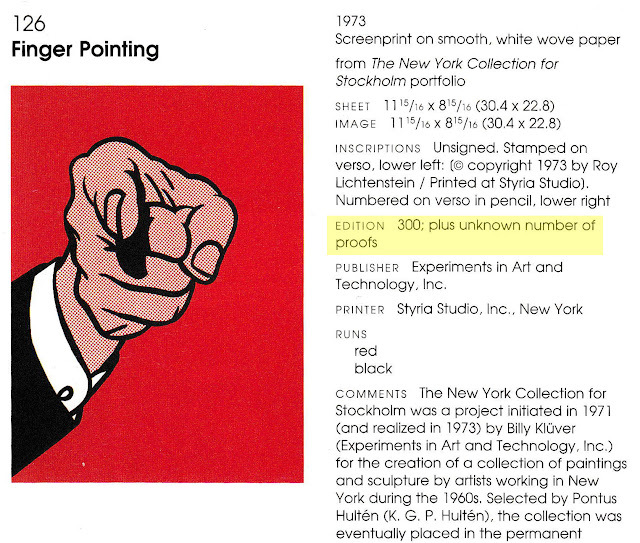 The Roy Lichtenstein Prints Catalogue Raisonné avoids reference to any Finger Pointing Printer's Proof edition. 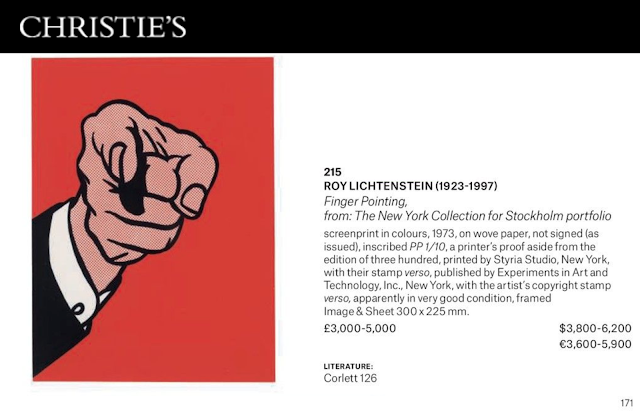 Although the Roy Lichtenstein Print Catalogue Raisonné correctly stipulates the 1973 Finger Pointing screenprint was published in a regular numbered edition of 300 impressions, the reference concerning proofs is vague; the Catalogue just states an "unknown number of proofs". Whoever is responsible for the 5 Fake Finger Pointing impressions from the non-existent edition of 10 Printer's Proofs didn't consult Heiner Bastian's Cy Twombly: A Catalogue Raisonné of the Printed Graphic Work 1953-1984, Richard Axsom's Printed Stuff: Prints, Posters, and Ephemera by Claes Oldenburg, A Catalogue Raisonné 1958-1996 or other Catalogue Raisonnés for prints included in the historic Stockholm Portfolio. Cy Twombly Untitled, 1973 print from the same portfolio is documented in the Cy Twombly Catalogue Raisonné on page 67, Bastian concurs that in addition to the regular numbered edition of 300, there are 100 other proofs, including: 9 PP's, 30 AC's; 31 PC's; 4 TP's; 25 AP's & 1 Workshop Proof. Do specialists at Christie's, Sotheby's and Phillip's know left vs. right? 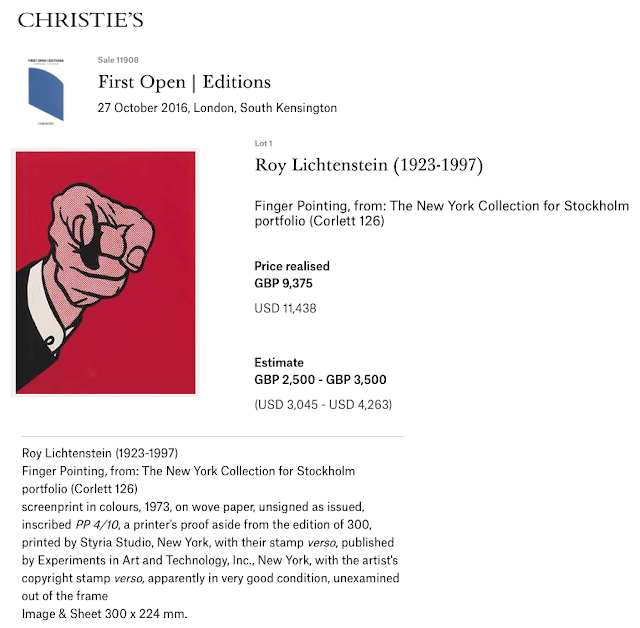 According to The Prints of Roy Lichtenstein: A Catalogue Raisonné 1948-1993, authentic Finger Pointing impressions all contain the Roy Lichtenstein copyright "©" and Styria Studio stamps on the lower left, with each numbered in pencil on the lower right. By comparison, the FAKE Printer's Proof Finger Pointing impressions are ALL incorrectly stamped on the lower right and numbered left. 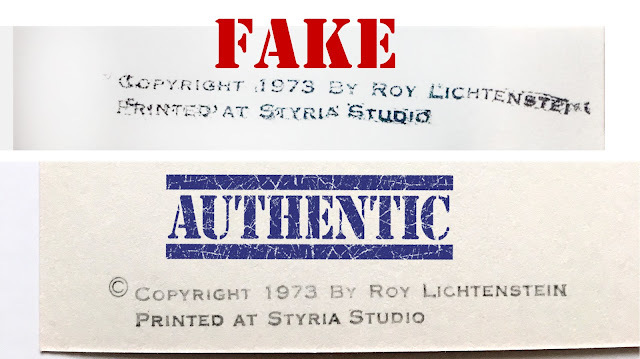 More disturbing the fake Finger Pointing impressions share wavy, distorted "Styria Studio" and "Roy Lichtenstein" stamps, lacking the requisite copyright symbol "©", evident on authentic impressions and clearly documented by Cortett in the Roy Lichtenstein Catalogue Raisonné. The stamps are obvious "homemade" forgeries, yet no auction house mentioned the location and copyright "©" anomalies nor reproduced the erroneous stamps. 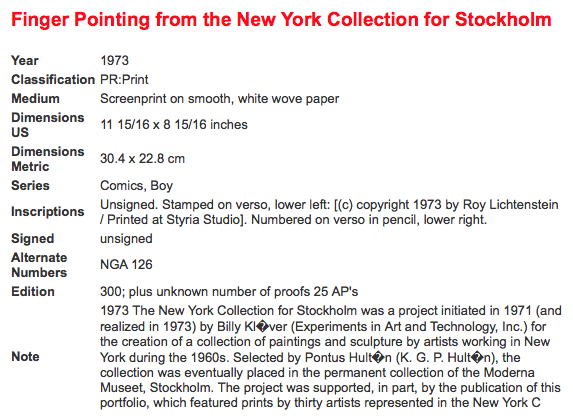 FAKE Roy Lichtenstein Finger Pointing stamp not only obviously wavvy, but lacks ©, stamped in wrong location. 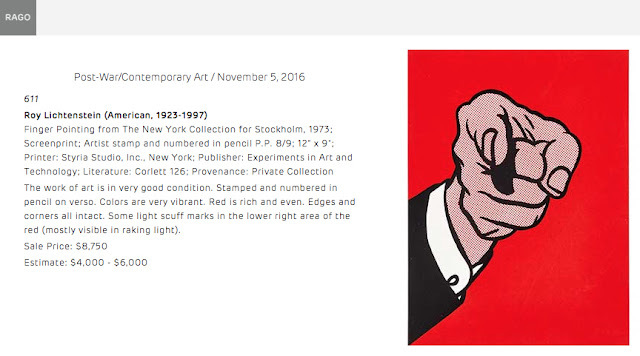 AUTHENTIC Roy Lichtenstein Finger Pointing stamp bears © along with stabile & legible blank ink stamp, verso. 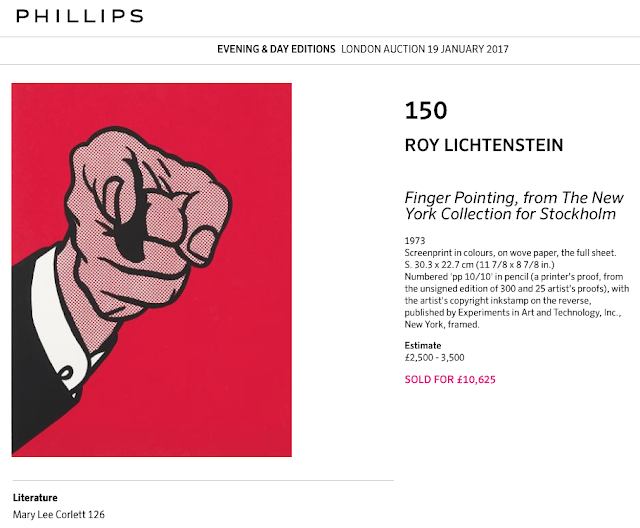 3 FAKE Finger Pointing Printer's Proof impressions were withdrawn at Sotheby's, Christie's & Phillips because we alerted the respective specialists. 3 more purported Printer''s Proof impressions were accepted for UK auctions in the first half of 2017, but withdrawn after Robert Grunder, Director, Joseph K. Levene Fine Art, Ltd., contacted each firm, explaining discrepancies of the fake Printer's Proofs vs. requisite documentation detailed in The Prints of Roy Lichtenstein: A Catalogue Raisonné 1948-1993. 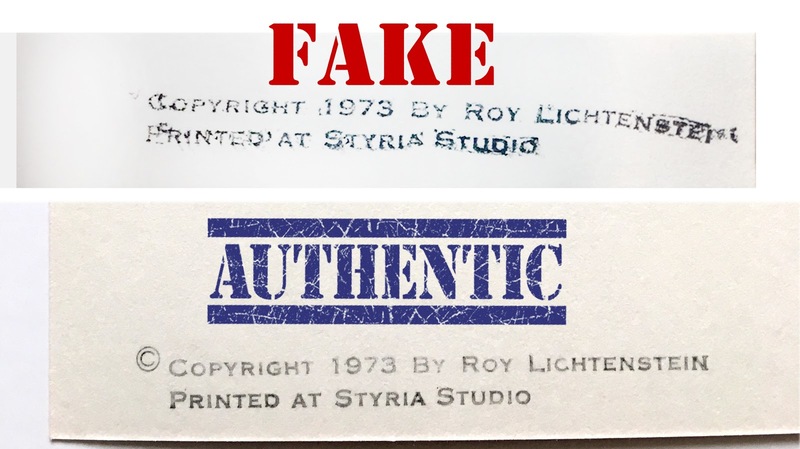 Careful review of the documentation location in conjunction with prior sale of sold impressions from the correct Printer's Proof edition of 9, makes it easy to spot fakes from the non-existent edition of 10. 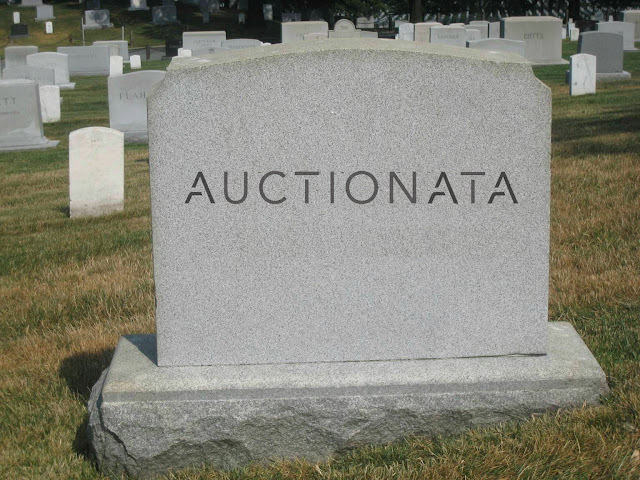 Why weren't the fakes recognized by UK auction house experts at each firm? 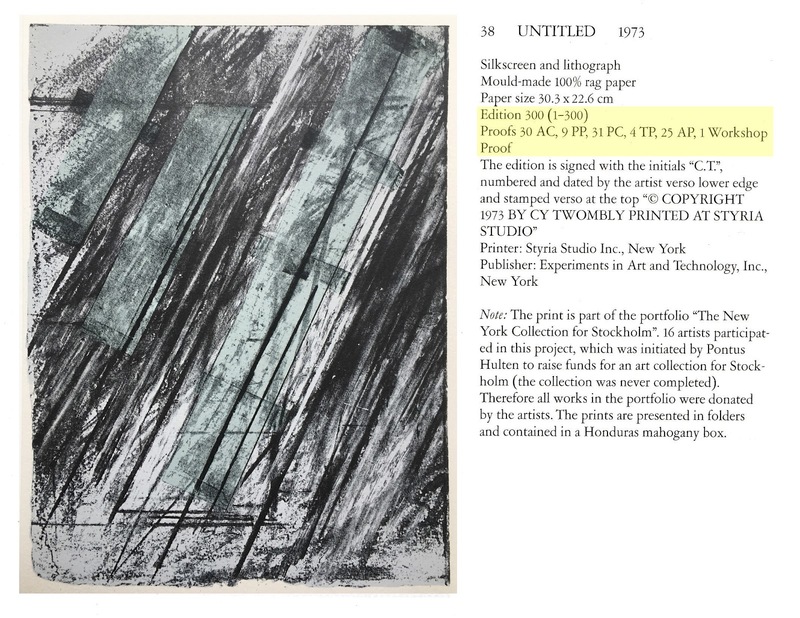 Consistent with the Cy Twombly & Claes Oldenburg Print Catalogue Raisonnés, authentic Finger Pointing Printer's Proof impressions from the documented edition of 9 have sold at public auction. It is incumbent upon the Roy Lichtenstein Foundation to update online records for Finger Pointing to accurately reflect the additional 100 proofs as published & confirmed by other Catalogue Raisonnés. Currently the online records only stipulate there are 25 AP's in addition to the regular numbered edition of 300. 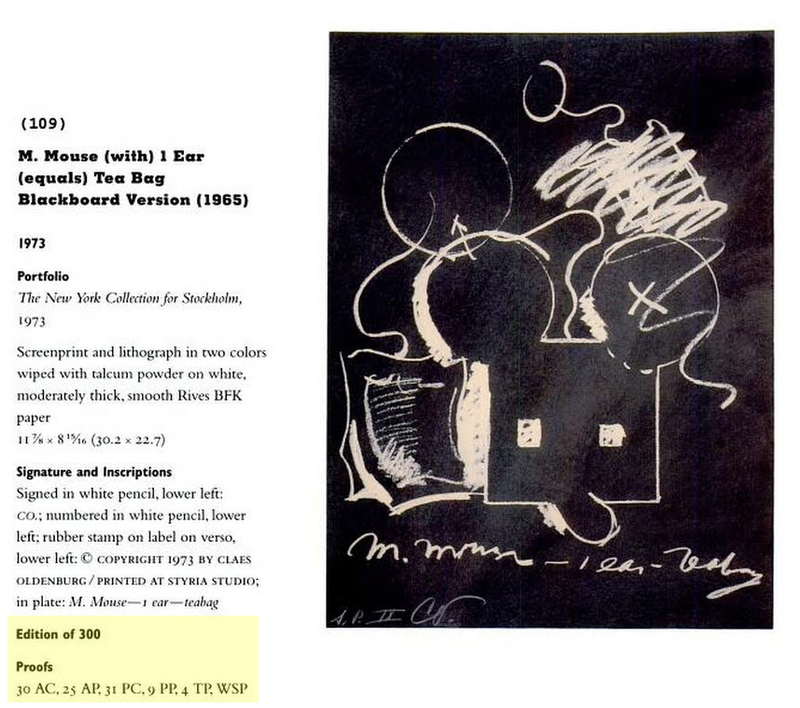 The vague and incomplete documentation from the Roy Lichtenstein Foundation certainly emboldens forgers who have the added incentive of a low, if any, cost of goods. 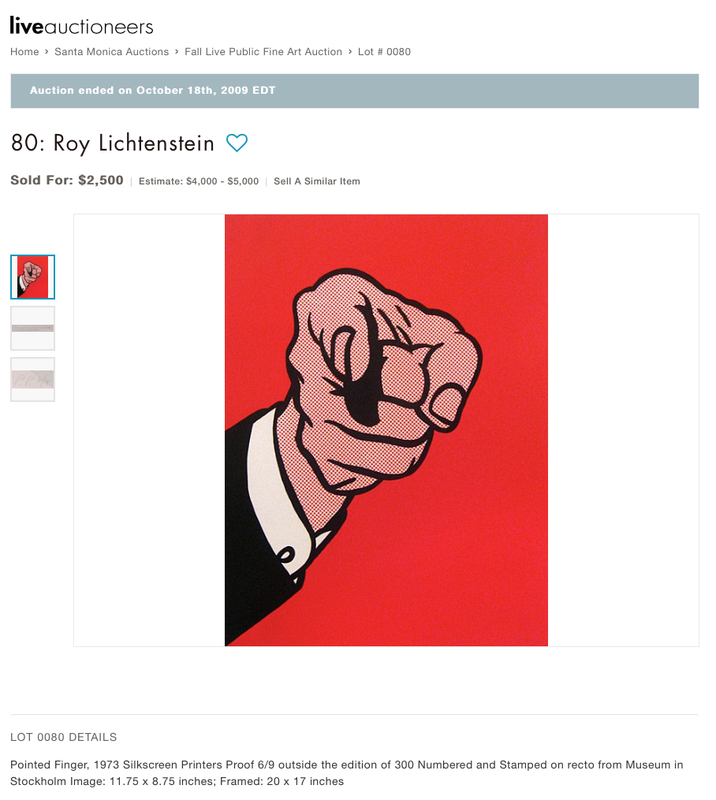 Since 90% of realized Roy Lichtenstein auction prices are prints, with nearly 200 of those being at least six figures, it is incumbent that the Foundation become more vigilant. While we will continue to point out fakes, perhaps the major auction firms need to be more careful in vetting material, lest they continue to sell suspicious works.